All that we have known and practiced are being questioned, challenged as part of prevention measures. How can you attempt to change decades, centuries of cultural practices in a few days or weeks? How can you change an entire society’s way of life? Understandably so, we resist some of these changes. In as much as we understand the reasons for the change, we find it hard to embrace it even at the risk of our lives and that of our loved ones. There is a long standing joke that “Liberian people like funeral business”. The same is true for most Africans when it comes to burial rites. We demand that our beloved dead ones are given a “befitting” burial regardless of relationship we had with the person while he/she was alive. You may not have spoken to that relative for years, but once that person is dead, bygones are bygones. We do not speak ill of the dead and “put hands together” and bury that person. We are open mourners. None of that stoic, well behaved poised crying you see on TV for us. Oh no! We get that grief out. We yell, scream, throw ourselves on the ground and cry. Sympathizers hold us, comforting us. They hug us. They cry with us. That is what we know. That is what we expect. Once the actual burial is completed, it is common to see people who had been bitterly wailing and yelling, crying inconsolably only a few hours before, laughing with family again. Holding a “cold one” and telling fond tales of the departed person. Funerals are also a time of family reunions and re-acquaintance, renewal of friendships. Meeting new additions to the family, including new boyfriends, girlfriends, baby, etc. All of this is a ritual. A process that goes on anywhere from a week to a month. In fact, in some Western African countries (Ghana and Nigeria, particularly) the dead can be kept up to 6 months just awaiting funeral preparations. One could say this is a way of dealing with grief which is why you probably don’t see so much depression and suicides in our culture. We mourn and move on. Then so in comes Ebola. We are now told to stop all of this. Now if someone we love dies, we are not to touch the body. Our society is far from what we see in the movies where you see someone faints and the person nearby picks up and phone and dials “911” and within minutes there is an ambulance there to whisk that ill person away to the hospital for treatment. In stark reality here in Liberia right now, people who do call the 4455 number (Ebola Response Center) have to wait hours for a response team and in some cases, a day or two. During this agonizing time, this is when the person is most infected. As such, family members are cautioned to stay away. We are an affectionate set of people. We love touching each other. Whether to console or to greet. You meet someone and the first thing that is expected is to say hello and extend your hand for a handshake to show you hold no ill towards the person. Refusing to shake someone’s hand is taken as a serious slight. The ritual has been established. Decades old.You greet the person verbally, shake hands and hug the person. Some do the customary kiss on both cheeks or pat the person on the back. Some men are fond of snapping fingers and doing elaborate handshakes. All this is done joyfully, smiling and talking. We are now told we have to stop this also. These days we have become Asians. You meet someone and you smile and do a slight bow or just say hello or wave. No touching, no handshakes, no kissing and certainly no hugs. Everyone you meet now smells of chlorine. The prevention measure now popular in and around the country. From offices and local businesses, to homes… fewer visits, fewer meet ups, less contact. We try to stay alive. In fact, Ebola now has this distrust for everyone you meet. People in the rural areas live off the land. For them, it’s quite simple: They farm. They hunt. They sell. They are now being told to not hunt (with no alternatives being provided) and not eat animals in the wild. After a full day on the farm doing various chores, people come home and have communal meals together, often eating in one big bowl with females eating together, males in another and kids in another. For people in the city who have the luxury of buying imported chicken and meat, it’s easy to remove “bush meat” from their palate, but this is almost impossible for the many whom this is their main source of meat protein. A way of life. Centuries old traditions and beliefs have held us together, served as the glue for families and communities. Handed down, generation after generation. Normalizing life, even after years of civil war. Yet, the reality and sheer number of death rate has us all shaken and scared and pushed us to come out of our cultural comfort zones and consider changing, adapting to collectively combat the plague. However, in as much as there is a lot we are resisting, we should also consider adapting. There is a saying in Liberia “such is the time, such is the condition”. We find ourselves in a difficult time and condition and we need to change fast. Re-orientate ourselves if we are to survive to tell the story. Then, maybe then, just maybe, we can go back to life as we knew it. 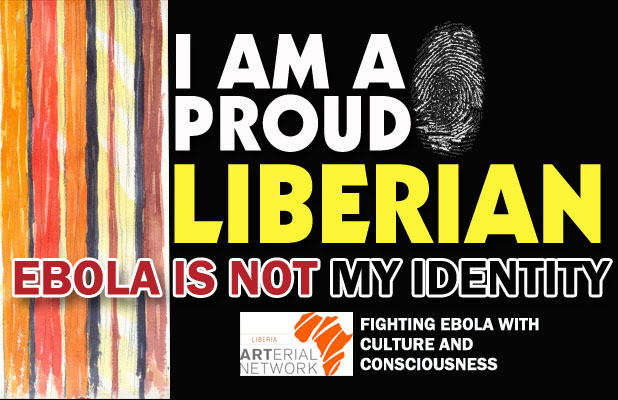 A draft of this piece was originally published on Liberian Jue. Artwork credit: Untitled by Kula Moore. Posted in Perspectives. Bookmark the permalink.